Samsung has pushed out a new spin on its Galaxy TabPro S, the Windows 10 hybrid which aims to take on Microsoft’s Surface Pro, and it’s a bling-based revamp we’re looking at here. The Galaxy TabPro S Gold Edition, as the name suggests, sports a rather fancy looking gold finish, and it peps up the hardware on board the 2-in-1. Instead of 4GB of RAM you now get 8GB of system memory, which should help Windows 10 run considerably more smoothly – and there’s good news on the storage front, with the SSD also being doubled up to a roomier 256GB. Otherwise, the spec for this 12-inch convertible remains the same: there’s an Intel Core M3-6Y30 processor driving the Super AMOLED 2,160 x 1,440 resolution screen, with 802.11ac Wi-Fi on-board and a pair of 5-megapixel webcams. The device is very sleek, being 6.3mm thick and weighing 693 grams, but there’s a solid battery on board which gives you a claimed battery life of 10.5 hours when you’re on the move (fast charging also means it can be fully juiced up in 2.5 hours). 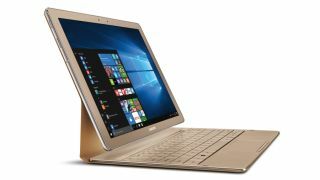 The other difference is the price, as the new gold version of the TabPro S will set you back $1,000 (around £820, AU$1,310) – whereas its predecessor retailed at $900 (around £740, AU$1,180), and has since been reduced to $800 (around £660, AU$1,050), so you will be paying something of a premium for the aesthetics and doubled-up storage/memory. In our review, we declared that the Galaxy TabPro S was easily one of the thinnest and most premium Windows 10 tablets we’d ever used, with a particularly impressive screen, but the keyboard base rather lets the side down. And sadly nothing has been changed in terms of that keyboard with this new incarnation.